1 ESGE recommends that prior to SBCE patients ingest a purgative (2 L of polyethylene glycol [PEG]) for better visualization. However, the optimal timing for taking purgatives is yet to be established. 2 ESGE recommends that SBCE should be performed as an outpatient procedure if possible, since completion rates are higher in outpatients than in inpatients. 3 ESGE recommends that patients with pacemakers can safely undergo SBCE without special precautions. 4 ESGE suggests that SBCE can also be safely performed in patients with implantable cardioverter defibrillators and left ventricular assist devices. 5 ESGE recommends the acceptance of qualified nurses and trained technicians as prereaders of capsule endoscopy studies as their competency in identifying pathology is similar to that of medically qualified readers. The responsibility of establishing a diagnosis must however remain with the attending physician. 6 ESGE recommends observation in cases of asymptomatic capsule retention. In cases where capsule retrieval is indicated, ESGE recommends the use of device-assisted enteroscopy as the method of choice. The choice between different settings also depends on sedation protocols. 2 ESGE suggests that conscious sedation, deep sedation, and general anesthesia are all acceptable alternatives: the choice between them should be governed by procedure complexity, clinical factors, and local organizational protocols. 3 ESGE recommends that the findings of previous diagnostic investigations should guide the choice of insertion route. If the location of the small-bowel lesion is unknown or uncertain, ESGE recommends that the antegrade route should be generally preferred. In the setting of massive overt bleeding, ESGE recommends an initial antegrade approach. 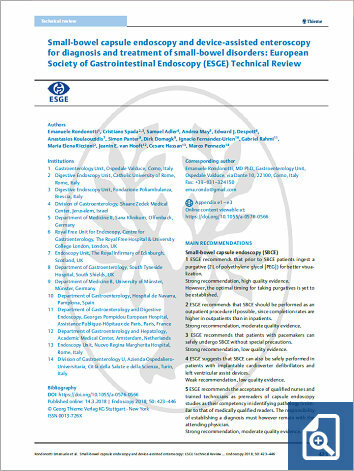 4 ESGE recommends that, for balloon-assisted enteroscopy (i. e., single-balloon enteroscopy [SBE] and double-balloon enteroscopy [DBE]), small-bowel insertion depth should be estimated by counting net advancement of the enteroscope during the insertion phase, with confirmation of this estimate during withdrawal. ESGE recommends that, for spiral enteroscopy, insertion depth should be estimated during withdrawal. Since the calculated insertion depth is only a rough estimate, ESGE recommends placing a tattoo to mark the identified lesion and/or the deepest point of insertion. 5 ESGE recommends that all endoscopic therapeutic procedures can be undertaken at the time of DAE. Moreover, when therapeutic interventions are performed, additional specific safety measures are needed to prevent complications.